'RHONY' Cast Attend Fashion Week & Begin Filming Season 11! 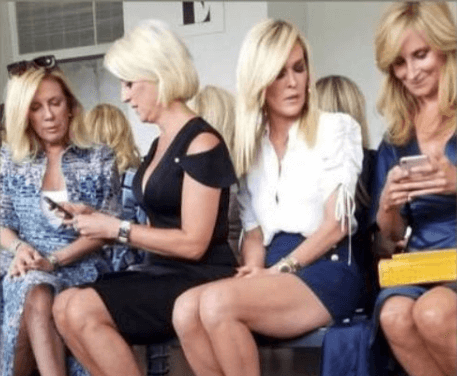 ‘RHONY’ Cast Attends Fashion Week & Begins Filming Season 11! The Real Housewives of New York City cast began filming season 11, without Carole Radziwill, this week. On Thursday, Ramona Singer, Dorinda Medley, Tinsley Mortimer and Sonja Morgan sat front row at the Pamella Roland’s show for New York Fashion Week, as Bravo cameras rolled. As reported Carole Radziwill, 55, announced her resignation from the hit Bravo reality series in July, after five seasons as a Housewife. Luann de Lesseps will also be returning for the show’s 11th season, despite struggles with addiction and recent stints in rehab. Luann blames her recent relapse on a lawsuit filed against her by her ex-husband, Count Alexandre de Lesseps, and their two kids. CLICK: Luann de Lesseps Gets Off Easy In Approved Plea Deal After Assaulting & Threatening A Cop! De Lesseps supported her daughter, Victoria de Lesseps, who walked in Nicole Miller’s runway show on Thursday. Bethenny Frankel’s RHONY return was uncertain amid reports she had not signed her season 11 contract and the death of her ex Dennis Shields. Shields’ death was acknowledged at the close of Wednesday night’s Real Housewives of New York reunion episode, where he occasionally appeared as Frankel’s part-time love interest. SHOCKING! Dennis Shields Autopsy Blocked by Family Amid Drug Overdose Rumors! However, Frankel, 47, shared an Instagram Live this week, and revealed that this was the last place she wanted to be, because she had no desire to get back to work. Jeff Lewis and Jenni Pulos Cut Business Ties & Friendship After Blowout! Luann de Lesseps Calls Out Ramona & Dorinda Over ‘RHONY’ Reunion Remarks!